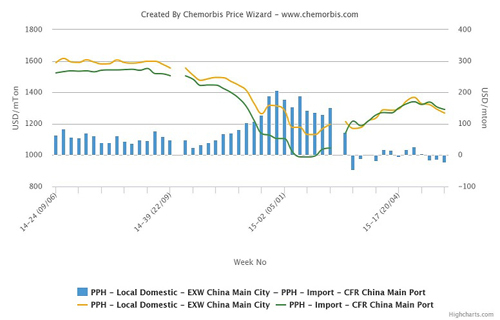 Players in China report that domestic PP prices continued to soften this week, causing domestic PP to trade at a discount to import cargoes, according to data from ChemOrbis Price Index. Attractively-priced local PP is said to be exerting downward pressure on import prices as sellers offering overseas cargoes are facing pressure to give ground on their prices in order to maintain competitiveness with domestic cargoes. 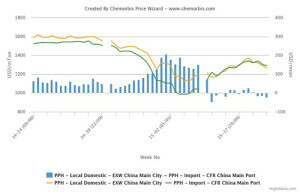 According to data from ChemOrbis Price Index, domestic homo-PP prices on an ex-warehouse China basis have been trading at a discount relative to import prices on a CFR China basis for the past three weeks, with the discount for domestic cargoes having risen to around $25/ton in the current week, the steepest discount for the domestic PP since early March. Local PP prices have been losing ground relative to the import market since the end of the Chinese New Year holidays, which took place in the second half of February. Prior to the holidays, the domestic market had been carrying a premium of more than $150/ton over imports.